Creativity cannot rest on eureka moments; it is a process, designed to consistently bring abstract ideas into the tangible world. Startups have an interesting tie to creative work. With limited resources, companies depend on the thinking and efforts of the people who power them--to see what other people don't see, to find a way with what is available. But your team needs dependability. Only amateurs sit around and wait for inspiration. Unfortunately, "how to be consistently creative" isn't the best topic to get advice on. There's a lot of pontificating without substance. Perhaps the best way to improve is through process osmosis, or learning from the means and measures of others. The output of creative idols is intimidating, and you can't expect to copy their habits and mirror their genius. But how they work is often surprisingly easy to relate to. One such person I took inspiration from was Ludwig van Beethoven. One way Beethoven kept creative promises was by means of his favorite pastime--long, solitary walks through the forested valleys near Vienna. He placed great importance on these quiet moments for reflection. He isn't alone: notable creatives the world over have shared similar sentiments on the utility of breaking up their day with walks. Gustav Mahler followed much the same routine--he would take a three- or four-hour walk after lunch, stopping to jot down ideas in his notebook. Benjamin Britten said that his afternoon walks were "where I plan out what I'm going to write in the next period at my desk." Since then, psychologists have taken an interesting step (or two) forward in understanding the benefits of walking. A Stanford study was able to show that walking consistently helped subjects produce more novel ideas, both during the walk and immediately after. Walking is exercise. It is well-established that exercise is beneficial for thinking creatively. Exercise improves one's mood, and studies show that working during a strong mood (especially a positive one) will result in a feeling of investment, which spurs on creative thinking. Allowing time to re-conceptualize. Walking is most often used as a break. With Beethoven and others, the trend was taking a long stroll to step away from earlier work where intensive thought had already been applied. Moments of clarity will remain elusive if the work isn't done first. A separation of stimuli. What you see is what you get when it comes to stimulus control--the environment you see impacts the behavior you get. For many people, a strict association of external stimuli helps create headspace. Here is where I work, here is where I think. Engaging in both at your desk could make it a nebulous location where too many things happen at once. Let's talk a little more about that. Harvard psychologist Dr. Shelly Carson has contributed greatly to understanding the muddy process of turning ideas into reality. In her book, Your Creative Brain, Dr. Carson highlights the importance of using strict boundaries between your absorb state (which takes in and evaluates information) and your synthesis state (when you execute on your ideas). Everyone has a built-in censoring system that filters thoughts and stimuli from the outside world before they reach conscious awareness. Learning to loosen up this mental filtering to allow more novel ideas to flow through is one of the biggest challenges for people who don't think of themselves as creative. Those capable of high creative achievement benefit from a lower "latent inhibition." They are, through personality or habit, less likely to ignore seemingly irrelevant stimuli. They absorb what others would filter out; whereas most people see a red wheelbarrow, some people see a Red Wheelbarrow. The absorb state is open (playful thinking), and the synthesis state is closed in order to execute (logical thinking). These are mental boundaries, but physical ones can serve as triggers: I'm at the coffee shop again, so it must be time to block out the world and work. Perhaps regular walks through Vienna's woods were Beethoven's preferred times to be open, where going down paths on foot lead to going down the many avenues of musical composition. For those of us who won't be producing Symphony No. 5 in our lifetime, there is still an argument to be made that trying to force everything to occur at your desk is a mistake. Stepping away lets you expand on what you've already worked on and removes you from work so you can think clearly. It's time to quit your desk and do your best thinking somewhere else. Walks, hikes, or never leaving your house and forgetting what the sun looks like--different strokes for different folks. Let's not miss the real point: creativity is nothing without creation. Your process is just as important as your output; more so if you plan to do this for a living. You can't schedule insight, so the worry is that a focus on habits will lead to habituation, making your once memorable work mundane. But solidifying your system does not preordain blandness--on the contrary, consistent process puts you where the good ideas can find you. 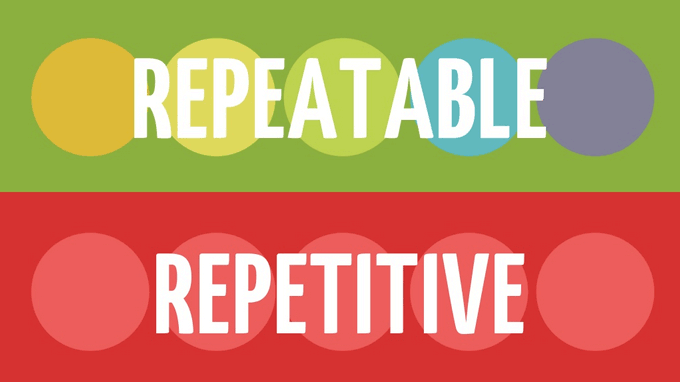 When done right, stability cultivates something that's repeatable, not repetitive. From a keynote by Dr. Peter Myers. Making ideas into more than wishes requires giving yourself some headspace--regular time to think and room to breathe before you dive back in. Planning time to walk away during the day allows early efforts to simmer and gives your later efforts a second wind. At the very least, don't be above rigorously testing your day-to-day. Your best ideas depend on it.